Researchers are on the threshold of building feasible quantum computers, with a few architectures inching ahead. Will we soon see a quantum leap in their progress? For more than two decades, one of the holy grails of physics has been to build a quantum computer that can process certain types of large-scale, very difficult problems exponentially faster than classical computers. Physicists are making progress toward this goal every day, but nearly every part of a quantum computer still needs re-engineering or redesign to make it all work. Current research is focusing on every angle of the quantum computer problem, including: new types of sources and ways to generate entangled photon pairs, new types of gates and their fabrication on chips, refined ways to create and control qubits, new designs for storage/memory buffers, “nondemolition” detectors, and ways to optimize them in various combinations. In spite of the difficulty with pulling all these pieces into one cohesive “winning” platform, researchers in the field agree it’s a matter of when – not if – quantum computing systems will be practical. Many predict 10 to 15 years. The creation and control of a single qubit is inherently difficult, but controlling many of them simultaneously is even harder. Quantum states are fundamentally limited for the same reasons that the number of transistors on a semiconductor board is limited, according to Christopher Monroe, professor of physics at the University of Maryland’s Joint Quantum Institute in College Park. The more of them you have, the more difficult it is to connect them and the noisier the system. 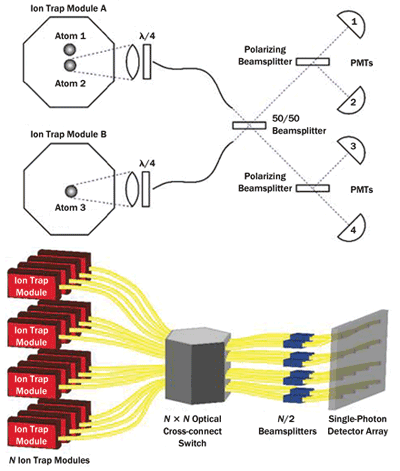 (Top) Optical photons from ion trap modules A and B are switched via an optical cross connect and sent to photomultiplier tube (PMT) detectors. (Bottom) The N qubits within the ion trap modules (red) are coupled via single-mode fiber to an N × N optical cross-connect switch, through N/2 beamsplitters, to an array of single-photon detectors. Photo courtesy of J. Kim/Duke University. “A single atom is an easy quantum system to control,” Monroe said, “but 1030 atoms connected is so big, it loses its ‘quantum-ness’ and behaves like a classical system. Having all the quantum states in synch would be impossible.” So Monroe and colleagues are focused on finding the limit in between the two. To compete with classical computing, however, scientists will need to greatly increase the maximum number of qubits they can effectively isolate and control in a system simultaneously. Thus, researchers are working toward smaller, controllable qubit modules that can be joined en masse via simple photonic connections to create large-scale quantum computers. Monroe’s team at JQI, along with collaborator Jungsang Kim, a professor of electrical and computer engineering at Duke University in Durham, N.C., have proposed and analyzed a technique involving a modular ion trap that may enable scalable, fault-tolerant quantum circuits (doi: 10.1103/PhysRevA.89.022317). Ion traps, the leading platform in the quantum computing field, consist of a small crystal with 10 or more trapped atomic ions confined using electromagnetic fields. The modular universal scalable ion trap quantum-computer (MUSIQC) architecture consists of up to 20 of these atomic ion qubits juxtaposed in a single quantum register. The qubits are held in a vacuum chamber at room temperature and are entangled via quantum logic gates mediated through the local Coulomb interaction. This makes them easy to isolate and control using laser light. Connecting these multiqubit modules, called elementary logic units (ELUs), could occur via fiber optics and an N × N microelectromechanical mirror array between different registers, which works even over large distances. 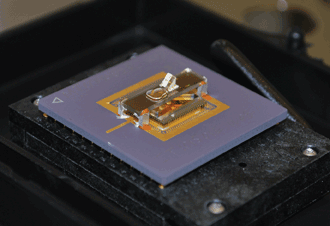 The MUSIQC architecture can be built on a silicon ion trap chip with integrated micro-optics, such as this module microfabricated at Sandia National Laboratories. Photo courtesy of Emily Mount/Duke University. As an example, the MUSIQC architecture could enable 18 N parallel operations via 150 N physical qubits using currently feasible technology. The JQI/Duke collaboration estimates it could perform a 128-bit addition in 0.16 s, far faster than today’s desktop computers. The total size of a single ELU in MUSIQC architecture would be fixed at moderate numbers of roughly 58,000 ELUs with 100 qubits per ELU. Although that limits the size of a potential quantum computer, the MUSIQC architecture is one practical path to integrating qubits into a large-scale quantum computer. One of the biggest problems facing practical quantum computers is simply reducing their high error rate. All known quantum systems experience decoherence of the quantum bus and dephasing that require quantum error correction (http://arxiv.org/abs/1309.4277). The goal of successful quantum computer architectures is therefore to reliably integrate quantum error correction with feasible, scalable technology – no easy task. At NTT Basic Research Laboratories in Kanagawa, Japan, researchers are pursuing a modular architecture in which each module is a simple optical cavity containing a diamond nitrogen vacancy (NV−) platform. The diamond NV− platform is a simple structure, a perfect lattice of diamond in which one of the carbons in the center is replaced with a nitrogen atom. This negatively charged NV− center in diamond creates a point defect that works effectively like a qubit. Such diamond NV− center platforms have already proved effective in many core parts of a quantum computer, from single-qubit gates to entanglement of two remote NV− centers. The system can operate at room temperature, which is an advantage over ion traps and superconductor approaches. The NV− center offers an electron spin and a nuclear spin, the latter of which works as a memory to store quantum information. The electron spin can be coupled to a photon to connect one NV− module to another, potentially enabling large-scale quantum computers. 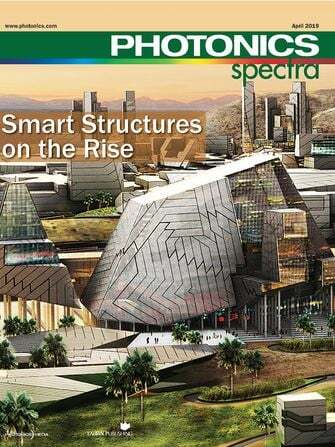 The modules are connected by fiber optic interconnects, which can simultaneously be used as off-chip memory/storage buffers. The role of the buffer is to delay single photons for short periods to facilitate circuit synchronization. The NTT group has also proposed (doi: 10.1038/ncomms3725) a photonic quantum processor based on an on-chip single-photon buffer using a coupled resonator optical waveguide (CROW). 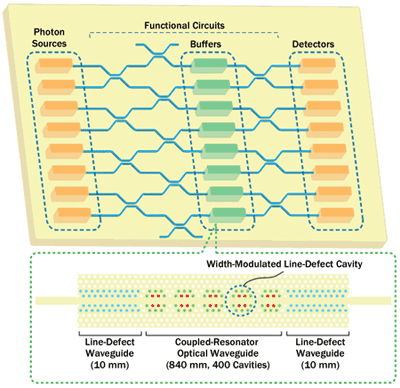 A photonic quantum processor based on integrated quantum photonics uses a quantum buffer based on coupled resonator optical waveguides (CROW). Photonic crystal nanocavities in the silicon chip integrate silicon wire waveguides with the photonic crystal section to access the CROW. Photo courtesy of K. Takesue/NTT Corp. The first of its kind, the CROW buffer consists of 400 high-Q (quantum efficiency) photonic crystal line-defect nanocavities. The model showed buffering of a pulsed single photon for up to 150 ps with 50-ps tenability while preserving entanglement. At the circuit level, the group found maximum tolerable error per elementary quantum gate to be approximately 0.73 percent. At the physical architecture level, they estimate that a large-scale computer with a similar error threshold is achievable in the near future, a significant step toward quantum computing. Even better, the team says that its electron-spin entanglement distribution scheme can also be applied to quantum-dot-based systems. Why are qubits so faulty? The quantum state of a qubit is a very fragile thing, easily disturbed by loss due to materials-related defects, noise from nearby control lines, or other qubits. “Intuitively, one can imagine the quantum state as a spinning top: If you don’t touch it, it’ll keep spinning. If you tap on it, the top starts to precess; and if you perturb it too much, it tumbles,” said Rami Barends, postdoctoral fellow of physics at the University of California, Santa Barbara. 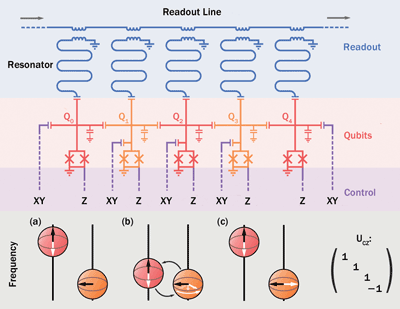 The circuit diagram of the UCSB superconductor-based architecture shows how individual qubits are driven through capacitively coupled microwave control lines (XY). Frequency control is achieved through inductively coupled DC lines (Z). The entangling operation uses a controlled-Z gate with three unitary representations (UCZ) as follows: (a) Qubits at rest, at distinct frequencies with minimal interaction. (b) Near resonance, the state-dependent frequency shift brings about a rotation conditional on the qubit states. (c) Qubits are returned to their rest frequency. Photo courtesy of UCSB. Fault-tolerant large-scale quantum computers require a platform that can scale up, a compatible architecture that corrects errors to below 1 percent, high gate fidelities (where fidelity = 1 − error rate) and measurement fidelities below the threshold, said Barends, a member of professor John Martinis’ group at UCSB. He and doctoral candidate Julian Kelly are co-first authors of a Nature paper describing a superconductor-based quantum architecture that paves the path toward those goals. Superconductor platforms enable construction of large quantum circuits compatible with inexpensive microfabrication. The approach used by Martinis’ group uses a Josephson junction design, which uses aluminum as the superconductor and 2-nm thin barriers of aluminum oxide to store quantum bits on a sapphire substrate. The key to making the surface code work is a 2-D array of Xmon qubits in which quantum logic and measurement correct the errors (doi:10.1038/nature13171). The processor chip has a linear array of five qubits featuring nearest-neighbor coupling. The gates modify the state of one qubit conditional on the state of the other, thus entangling them. The photons that are sent to the qubits have a 6-GHz microwave frequency, which can be generated electrically. The integrated Josephson quantum processor developed at UCSB consists of Al (dark) on sapphire (light). The five cross-shaped devices in a linear array are the Xmon qubit. To the left of the qubits are five switchback-shaped coplanar waveguide resonators used for individual-state readout. 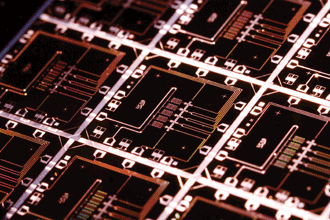 The qubits are wired to contact pads at the edge of the chip. Photo courtesy of Eric Lucero/UCSB. To eliminate thermal noise at room temperature, superconductor-based platforms require complicated cooling systems. The next step to push the error budget well below the threshold may lie in better materials with lower loss, Barends said. Nevertheless, the work of the UCSB group shows for the first time that the logic gates needed for error correction are possible in a real device. If and when these quantum systems do finally work, what applications will they address? A quantum computer can best be pictured as an amazing special-tool supercomputer that can reformulate a difficult problem that can be checked with a simple function call once the answer is known. Factoring very large numbers is an example of an important problem in quantum computing that is uniquely simple to check. If a quantum computer produces potential factors of a number with a thousand digits, it’s very easy to multiply them with a PC to check their validity. Not many problems are like that. Once other indirect methods to verify a quantum system are developed, airlines and the military might someday use quantum computers to find an optimal way to route flights or troops, and companies like Google could use them for search engine optimization or data filtering. However, don’t expect quantum computers in the home anytime soon. Although the approaches based on ion traps and superconductor techniques have taken the lead in the past few years by wiring together qubits in modules and arrays, there’s no telling which approach will prevail, or when. Quantum computing is based on qubits, the simplest building blocks of quantum information. In classical computing systems, a computer bit is represented by either a 0 or a 1. The analog of a computer bit, a qubit is a unit of information that, like a bit, exists in either of two physical states. Schrödinger’s principle of superposition says that the state in which a qubit exists isn’t known until detection, so until then, it’s in a superposed state of both. Qubits can occur in several different manifestations. An electron, for example, offers two states of spin. A photon can also offer two states by way of horizontal or vertical polarization. In this way, for N qubits, 2N quantum states can be represented.